The 405 boys are in California for this season of Discovery Channel's Street Outlaws, and one street racer in particular is catching the attention of die-hard fans. 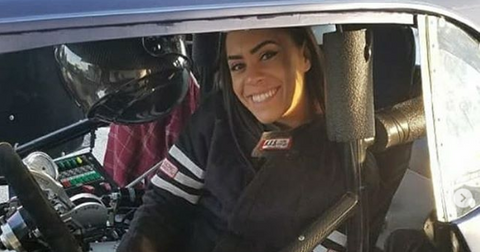 The babe in question goes by the name of Aleisha Beckum, and although we know she's one of the sexiest racers in Cali, many are eager to learn more about the grudge racer. So who is this hot racer on Team Boddie? Here's everything you need to know about Aleisha and her '68 Camaro rig. So, who is grudge racer Aleisha Beckum? Sacramento-based Aleisha, 28, reps Team Boddie and grudge racing, hard. As Boosted and Big Chief tried to explain to the rest of the 405, grudge racing means "get ready for 30 minutes to an hour of screaming." Per Monsters and Critics, "a grudge racer is a modern-day drag racer who trash-talks and races by strict ground rules while street/track racing." This is probably why the 405 team was having such a hard time keeping track of all the information Boosted and Big Chief were trying to spring upon them. According to a recent profile Aleisha received on Match Race Madness, the 28-year-old has been grudge racing for about a year now and is already making a name for herself on the scene. "Aleisha is paving her own path in the grudge racing world with some serious passes down the 1320," it reads. When she isn't grudge racing, Aleisha likes to work on her fundamentals and practice bracket racing. Her best attributes are racing with "NO EGO," and emitting "positive vibes only," per Aleisha's Instagram profile. No, we're not kidding. Blue Balls is the actual name of Aleisha's '68 Camaro rig. According to Match Race Madness' Facebook page, this is not your parents' old Chevy. 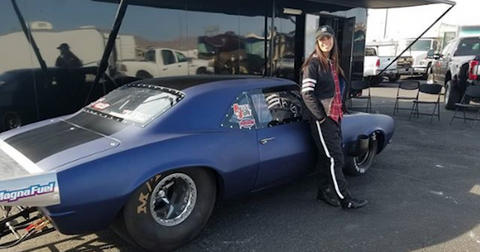 Blue Balls delivers "big-time performances with an AES big-block Chevy nitrous engine," and boasts a "a Power Glide transmission and Mark Williams rear end.” "Blue Balls looks a little mean," Aleisha recently posted on her Instagram page. How long has Team Boddie been around? Team Boddie might be new to Street Outlaw fans, but the team has been around in the drag racing world since the 1960s when brothers Kenny and Ronnie Boddie started racing a 1956 Buick Roadmaster and a black and blue 1968 Camaro in San Francisco's Bay View district. Since they got their start, the brothers now have 10 kids between them and have kept the racing legacy going strong in the family. Aleisha races for Jermaine Boddie, who's been a familiar face on Discovery Channel ever since he raced against Birdman of Texas in House of Grudge. 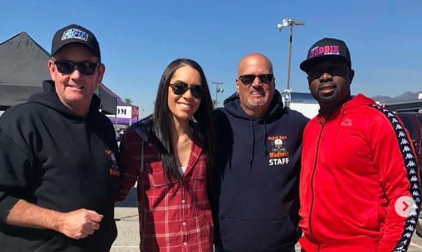 He later appeared on Street Outlaws in the 2017 season finale as part of Team Cali. Street Outlaws airs Mondays at 9 p.m. on Discovery.